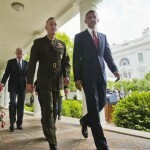 On Tuesday, President Barack Obama nominated Marine Corp. Commandant, Gen. Joseph Dunford Jr. as the next Chairman of the Joint Chiefs of Staff. In tapping Gen. Dunford to replace the retiring Gen. Martin Dempsey, Mr. Obama has chosen a steady and widely respected Marine commander, to help guide him through the various administrative and geostrategic military challenges facing the country. With a military career spanning well over 40 years, Gen. Dunford has held positions from the platoon to the most senior levels of the military. He will be in a unique position to allow his extensive experience as a military commander and bureaucratic professional, to help guide the president and his administration. In brief, the Joint Chiefs of Staff (JCS), was created through the National Security Act of 1947 under President Harry S. Truman. Collectively, the JCS is a body of senior military leaders from within the Department of Defense. The official role of the JCS has undergone several changes and reforms over the years. For instance, they were once granted total operational control over the resources and units within their respective commands. However, since the Goldwater-Nichols Reorganization Act in 1986, each military service chief now reports directly to their particular secretary of the military department concerned. The obligations to their respective JCS duties take precedence to their roles under the secretaries for each department however. Also with Goldwater-Nichols, the chairman of the JCS became the principal military adviser to the president, the Secretary of Defense and the National Security Council. Though the JCS has no executive authority to command combatant forces, all JCS members are military advisors and may issue advisory statements or opinions through the chairman. Gen. Dunford will be replacing Gen. Dempsey who is known around Washington circles to be a straight-shooter and a systematic thinker. Mr. Obama’s relationship with Gen. Dempsey throughout his four year tenure as chairman was marked by closeness and a shared intellectual understanding of global events. Gen. Dempsey retained a keen focus on events unfolding on the ground even with the changes in technology and the greater emphasis on issues such as cyber-security, space, drones, etc. President Obama appreciated this attention as countries such as Iran, Iraq and Syria, along with the spread of extremist radicalization across North Africa, remain points of consternation for the U.S. In appointing a U.S. Marine to occupy the chairmanship, Mr. Obama undoubtedly is sending a message to the world that U.S. ground and naval operations are still the cornerstones of our national security. Challenges that Gen. Dunford will undoubtedly face upon taking office will include efforts to combat the Islamic State of Iraq and the Levant (ISIL), progress with the Assad regime in Syria, aggressive developments from Russia, as well as the current state of America’s pivot to Asia. Gen. Dunford will also feel pressure from events taking place on the homefront. As Marine Commandant, Gen. Dunford experienced firsthand the detrimental effects from the sequestration and its impact on steering a worldwide organization such as the U.S. military. Gen. Dempsey once noted that sequestration affects programs and military readiness. The top uniformed and civilian members of the military recently told Congress that further sequestration cuts would essentially put the country’s national security at risk. Thus, Gen. Dunford’s ability to effectively lobby on behalf of the Pentagon, and to marshal support from members within Congress, will prove to be key determinants of how his chairmanship will proceed. Other challenges will include keeping international coalitions together as the Obama administration continues to deal effectively in various diplomatic settings in North Korea, Iran, Russia and other places. Some of Gen. Dunford’s previous military commands however, make him well-suited to carry-out these initiatives. During his command in Afghanistan, he met frequently with NATO and other coalition leaders. His responsibilities in prior situations have also allowed him to become well-connected throughout the international community. I expect little opposition to Gen. Dunford’s nomination, as he has passed through Senate hearings with flying colors before. He is a native son of Boston and a graduate of both Georgetown University and the Fletcher School of Law and Diplomacy at Tufts. He has been given the moniker “Fighting Joe” by members within the ranks of the military, due to his steadfast aggressiveness even under extreme pressure. We say farewell to Gen. Dempsey and thank him for his remarkable service to the nation. We look forward to the addition of Gen. Dunford and the perspectives he will provide as the country continues to lead the free world.